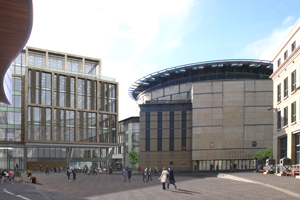 Edinburgh International Conference Centre (EICC) has got the go-ahead for an £85m expansion that is expected to double its earning potential. The EICC yesterday won planning permission for the extension, which includes the creation of a 2,000sqm hall and will increase the venue's banqueting capacity from 850 to 1,800. Work is due to start in June 2010 and should be completed by early 2013. City of Edinburgh Council economic development convener Tom Buchanan said the EICC had already generated more than £250m for the local economy and this would increase to £2.34bn over a 30-year period. EICC chief executive Hans Rissmann said: "Our new space will help us maintain a market-leading position by attracting bigger and more profitable events to the city."